Exhibit at AVAM “Shock and Awe"
BALTIMORE (Reuters) - Matt Sesow has taken a winding path toward becoming an artist. When he was 8, his left arm was amputated after an airplane propeller struck him. He grew up, became a computer programer, took up painting as a way to meet people and did a stint in the Solomon Islands as a Peace Corps volunteer. But art soon developed into more than a pastime; his paintings became a way of dealing with his childhood trauma and he began working on his art full time. 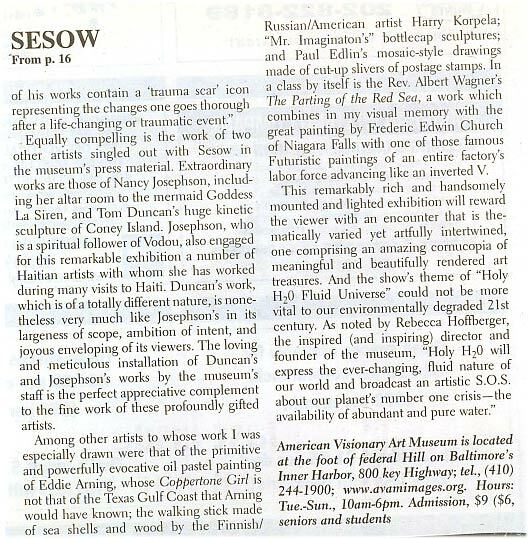 Sesow didn't have any formal art training, but his work is gaining recognition in the small but growing world of so-called visionary art. The genre -- sometimes called outsider art, art brut or contemporary folk art -- groups works by self-trained artists who deal with very personal issues, often their own disabilities or emotional problems. 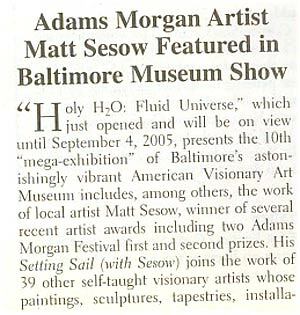 Two of Sesow's paintings are part of a new exhibit at the American Visionary Art Museum (AVAM) in Baltimore, which was founded in 1995 and is the first U.S. museum dedicated to visionary art. 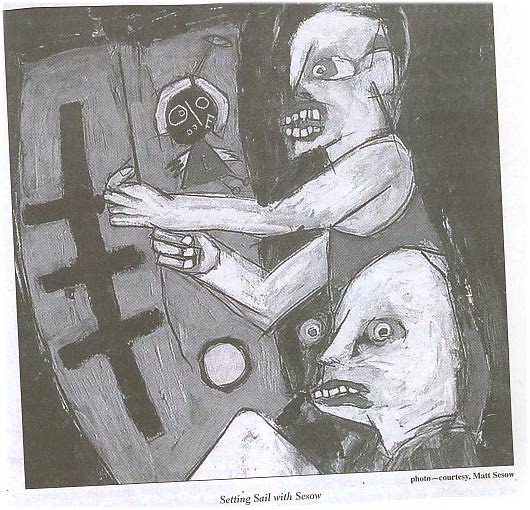 Through his art, Sesow worked through the emotional knots created by his childhood accident. AVAM founder and Director Rebecca Hoffberger was working for the department of psychiatry at a local hospital and got the idea for the museum in 1983. "I really wanted a place that was structured toward (people) who appreciate and value the great creativity," Hoffberger said. Dedicated by an act of Congress, the museum was funded primarily by her husband, LeRoy Hoffberger, from a wealthy Baltimore family, Anita Roddick, founder of The Body Shop cosmetics firm, and Zanvyl Krieger, a lawyer and sports entrepreneur. After nine years, AVAM is growing and next month opens an addition that doubles its exhibit space and adds classrooms and workshops. - A huge kinetic sculpture of Coney Island, a historic amusement park located in New York, by Tom Duncan, who began making art when he was 4-years-old after his aunt gave him his first clay set. - A floor-to-ceiling aquarium made of fish from mostly recycled beer bottle caps by Mr. Imagination (Gregory Womack), who describes himself as a collector of cast off objects. - A 7-foot sculpture and altar room, which contains over 100 pounds of beads, glitter and sequins dedicated to "La Siren," a mermaid goddess by Nancy Josephson. Her work is inspired by her visits to Haiti and her spiritual journey of becoming a Voodoo priestess. John Maizels, editor of Raw Vision Magazine, said visionary art is generally self-taught art that exposes the artist's inner depths. Some might think of visionary art as folk art. But while folk art is also self taught, Hoffberger said, it differs by being "learned at the knee" and passed from generation to generation. Sesow's paintings communicate the emotional power of his healing. One of his works in the AVAM exhibit, titled "Out of Water," depicts in loose, abstracted brush strokes and bright colors a scuba diver emerging from water. On his goggles is a line with three crosses that Sesow uses to symbolize the trauma of his childhood accident. For years after his hand was amputated Sesow wore prosthetics, but about a year after he started painting, he gained confidence and stopped wearing his artificial hand. Sesow feels freed now that he doesn't have to try to be and look like something he isn't. "At first it was a difficult decision," Sesow said. "But after taking the 'electric hand' off for good, some great things happened. I noticed people actually stared less at me. It was as if the stiff, sometimes green hand had caused more questions and attention to my disability than not wearing it."